The Duluth Forge Compact Entertainment Center features our Furniture Quality construction providing you with heat, beauty, and function. 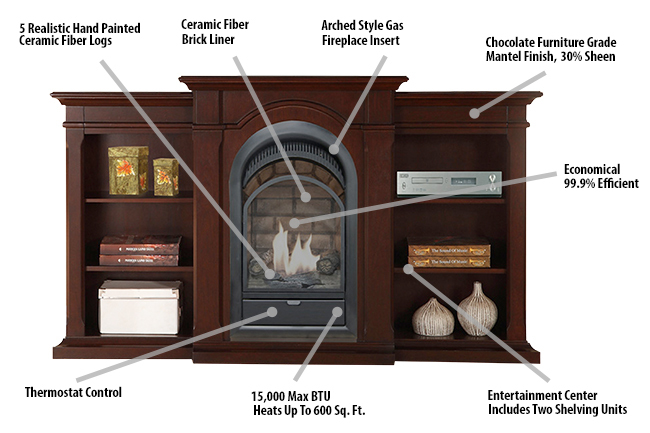 The dual fuel gas fireplace insert provides 15,000 BTU of heat, enough to heat 600 square feet of space. The Entertainment center allows for TV placement, electronics interface and DVD storage or a mini library for books and Knick knacks. This coupled with the stylish arched fireplace with tall realistic flames and fiber brick liner creates a great home ambiance.